The CCSS Math standards are designed so that students continually build on their knowledge from year to year. The four main concepts of 6th grade include : ratios, division of fractions, and extending number sense to include negative numbers, developing statistical thinking, and writing/using expressions. Sixth graders continue their learning of geometry by working on volume and surface area. 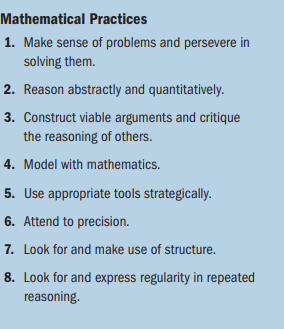 It is important that students are applying the eight mathematical practices to their learning on a consistent basis.